After completing the first international Afghanistan marathon last October I was sure there wouldn't be another race to run anytime soon in this war-torn and security-paranoid country. I was actually looking for a marathon to replace the Athens Classic on 8 November, to which I had signed up (and paid for) but couldn't take part because my first recreational break could only be granted one week later. I was thinking about the Istanbul marathon on 15 November - never done before - a good way to run from Asia to Europe on my way home to Athens. Until I received a strange email with the announcement of a 100k/24 hour charity race/walk in downtown Kabul, on Friday 13 November. 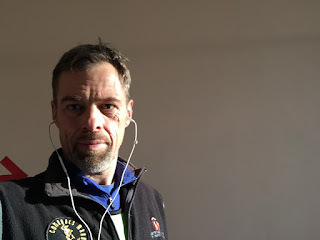 Wasn't quite sure if it was serious: running 100k within 24 hours in a city with zero freedom of movement, at least for internationals and UN-staff in particular - where, whom? The charity cause however was more than serious: raising $100.000 to help Deba and Nageena - two poor Afghan sisters - with a life-saving bone marrow transplantation in an Indian hospital. I called organiser Dave Lavery and I agreed I would sign up after I saw the race venue and checked with security about its safety. Next Saturday I was dropped off at a gate of a compound close to the popular ‘Butcher street’ in downtown Kabul. Security guards with automatic guns let me in and led me to Mr Lavery - a tall well built, grey-bearded jovial and vocal Canadian expat with many years of Kabul in the backpack. In the typical Canadian no-nonsense style, he immediately showed me the race-course. While walking next and behind Dave - in many sections there was only space for one runner at a time - my eyes must have must have looked more and more puzzled - was it possible to run 100km or more on this 875m lap of which only 300 meters outdoors and 575 meters indoors in an empty residential building over 6 floors connected by 220 stairs, from basement to roof-top - with splendid views over Kabul and surrounding hills? Dave might have noticed my ‘puzzlement’ but reassured that security would be UN-compliant, with Nepalese ‘ghurka’ soldiers fending of any possible attack - sic. After this commitment I had no arguments left in the pocket not to confirm my participation next Friday. Obviously there was no time left to train properly for a race like this. 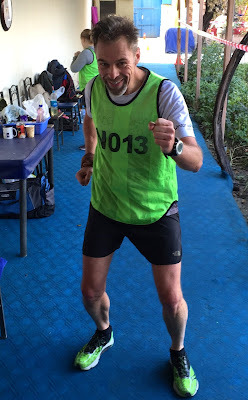 This year wasn't very successful on ultra-running so far - my longest distance was not more than 62 km, in a mountain race in Northern Greece (Zagori mountain run), not even completing the full 80k. Now I was supposed to run 100km or even longer within 24 hours. I would go with the flow - there was no pressure to perform or to compete. 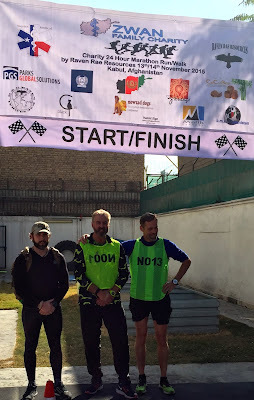 The decent performance at the Afghanistan marathon some weeks ago should suffice to confidently aim for a distance beyond the marathon mark - despite the odd course of maybe the most compact ultramarathon in the world and human history. The entire week leading to the race it was raining and very cold in Kabul - under these circumstances it would be nearly impossible to run the slippery surfaces, stairs and sharp turns. But the race was on Friday the 13th, usually my lucky day since my birthday on the same rare combination more than half a century ago*. Friday morning was still cloudy but skies would be blue by the time of the gunshot - a nice prospect to start the race. I arrived well on time to organise my pit-stop with my choice of drinks and foods to keep going, as well some warm clothes for a night that would flirt with freezing temps. BBC Persian and a national Afghan TV (Tolo) showed up for interviews footage with focus on the charity story around Deba & Nageena who were present with their lovely parents. All runners - around 30 national and internationals, fairly gender balanced to Afghan standards - had the chance to meet and greet with the family - a strong moral boost to keep going for their well-being. I paid my fee and got race shirt No13 in return - a positive sign? At 12 PM sharp, Dave Lavery finally blew the whistle and there we went - stepping into a new adventure. The first laps were quite hectic with many runners starting way too fast and bumping onto other slower runners on stairways and narrow alleys. 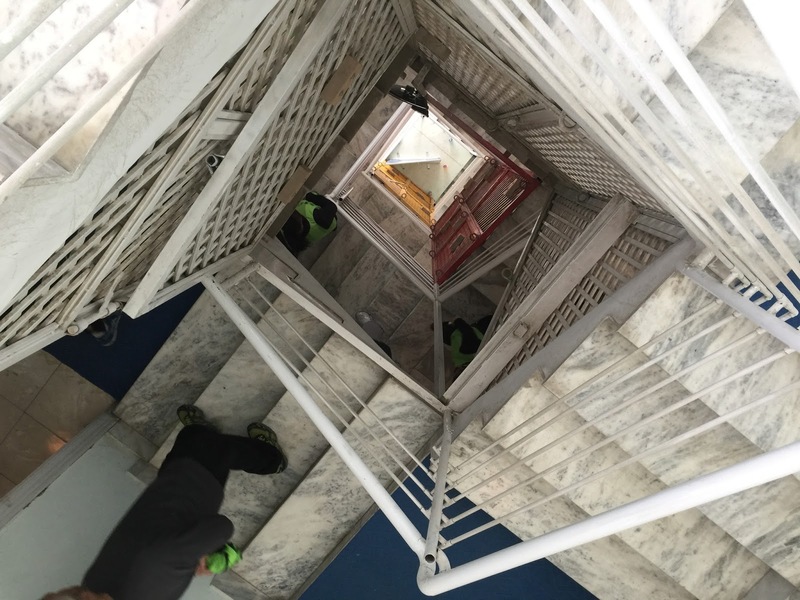 Race director Dave was not only running himself but also correcting other runners on the course to keep left on the stair- and doorways. First laps passed quickly but also made clear this would become a tough race later on, both physically and mentally. Only the first 3 hours I could complete 8 laps per hour but needed to wind down to seven to save energy for the long haul. After 8 hours of endless laps, narrow corridors, thousands of stairs, hundreds of floors and rooms in and out - I needed a first longer break of around 30’ to restock carbs and proteins with a hearty meal of grilled chicken breast with rice and carrots, accompanied by a can of malt beer. That hour I could only complete 3 laps, the lowest number of the entire race. The next hours I only logged 5 laps per hour but I kept going while other runners took longer breaks or simply called it a day with sore knees an battered quads - some of them would later resume running and walking after a few hours of sleep. In the wee hours after midnight there were only three non-stop-runners left that seemed to compete for the longest distance: Dave, the organiser, Sean MacGillivray, a Scottish endurance athlete running non-stop with a backpack of 12 kilo’s (no kidding!) and I. Some younger Afghan runners went to bed after midnight, claiming they ran more than 70k and would wake up on time to complete the last 30k before 12pm next day - a claim that the organisation commented with some skepticism. The counting of laps was not electronically but based on verbal communication to nurse Kim, who was not only standby for med-support but also registered the hourly number of laps on a big white board. I found it very difficult to memorise the number the laps per hour - your mind is not working properly throughout such an ordeal - so I kept track of my laps by marking every lap on my own whiteboard. How many times I got so disoriented that I ascended the rooftop floor a second time instead of going down - with other runners correcting my mistake. But despite the monotonous laps and frosty and wacky cold night I can cope with the much-feared sleep deprivation and mark lap after lap, thanks to a shift from running to fast walking. I reached the 50k mark around midnight and managed to log the 100th lap by sunrise - the magical moment when the night is pushed away by a new dawning day - with a golden sun reflecting on the frozen damp on the rooftop - making it extremely slippery - and reflecting its rays on the surrounding mountains with their pink coloured snow cover - pure magic. Even the patrolling Nepalese ghurka’s were at awe. I kept going and by 8AM I finally reached the goal mark of 114 laps or 100 km. 100 km in and around one building! Now it was time to listen to the competitive voice in me. Where are the others and how far and fast will the they go? Sean looked stronger and faster than ever and I was sure he logged more laps than I did so far. Dave have some setbacks due to medical tests but picked up the pace after sunrise. Also the young Afghan runners - some very committed young men and women - rose from their beds and were running again. As I could not read the running minds I decided to break the fast with a superb omelette and then add some more laps to compete for the lead. Around 11:30 it was clear I was out of reach and concluded the last lap, number 130, totalling 113,75 km and 28.600 stairs or 13 vertical km’s up and down. Sean already quit the race when he reached the 100k mark but Dave continued until the 12pm gong and accumulated 119 laps or 104,125 km. The podium positions were clear and of course I was happy with my win, but hats of for Sean with his 12kg backpack - an outstanding performance as Dave later said - as well for Dave himself - running strong at age 55, with only one kidney, coming back from a long recovery, running while organising and running while sampling blood every couple of hours - ‘il faut le faire’. Also hats of for the young Afghan runners that kept going until the gong, some of them - and Zainab in particular - the only Afghan woman finishing the Afghanistan marathon some weeks earlier - running, walking and finally limping a large part of the race in pain. The race event was concluded with a great BBQ meal and some time together with the lovely sisters and their mom and dad. I was awarded with a gift box with Emirates goodies and a nice certificate as Best Male Runner. After the race I went straight to the gym of Alpha compound, not to run more but to enjoy a cooling-down swim and a re-heating sauna and hammam. Maybe thanks to this early-recovery workout I only experienced mild soreness the days after the race. It was not the legs but my lungs that needed most time for recovery: running 13 vertical kilometers at an altitude of nearly 1.800 meters with heavily polluted outdoor air is certainly not ‘trouble-free’ for a runner with a history of asthma like me. That was also the main reason why I was forced to a brisk walk for the second half of the race - but it was also the key for success as I could keep going without breaking down. It was my first completed 24 hour race, actually the longest race I ever ran in time - not in distance (that was Olympia Race in 2012 with 180,1 km in 20h15). 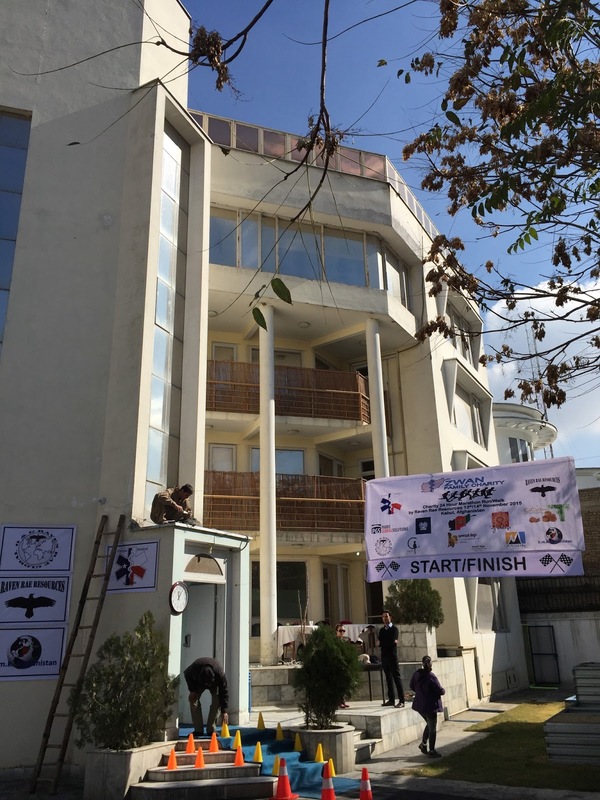 In any other ’normal’ 24 hour race a distance of 113 km would be considered as a turtle-performance, but this race was everything but normal - it actually might qualify for one of the most compact ultramarathons ever, ‘thanks’ to the extreme security conditions imposed upon expats in Kabul. Once more it is proven that nothing is impossible and that there are no good excuses not to run, wherever, whatever. Apparently, the entire event was ‘interesting’ enough for the BBC to make a short reportage for its Persian broadcasting (see link below) but lets not forget the cause: the solidarity with the Thalassemia sisters and their parents. The event raised around $10.000 or 10% of the needed funds. In other words more funds are most welcome, so please also donate - my race fee of $125 went entirely to the fund. For those that want to support the worthy cause please visit the Gofundme site; https://www.gofundme.com/sx6kh7fk/donate please spread the word so we can ensure we raise the necessary funds for Deba and Negeena. Thank you!